Nothing is all upside. Even Lean management has downsides, perhaps more than we care to acknowledge. When Lean transformations fail, we say that the people in charge did not understand Lean and therefore did not do things the right way. When we encounter Fake Lean, we say the same thing. We try to tell leaders and others that there is a right way and a wrong way to apply Lean principles and practices, while recognizing that circumstances vary a bit from one organization to another. We are saying that quality – doing it right – is important when it comes to Lean practice, and in most cases, the quality of Lean practice is low. But, have we considered the possibility that Lean management itself suffers from fundamental flaws, and that we put many organizations onto a path where the great majority are unlikely to succeed? Perhaps we are aware of Lean’s flaws and simply discount or ignore or them because it is easier to say that leaders did poor quality work than it is to try correcting the flaws. A different way of thinking, which is difficult for experienced leaders to understand and learn. New ways of doing things, which are difficult for experienced leaders to practice. It is super-easy to misunderstand or be overconfident in one’s understanding. Takes years of practice to understand progressive management and do it well. Selected process improvement tools have far greater appeal than a new system of management. Tools and methods are easily divorced from progressive management principles and subsumed into conventional management practices. The rate of improvement is slow and bound to disappoint when leaders focus on tools. It is easy to generate the appearance of improvement vs. actual improvement. Minor improvements have little or no impact on cost reduction and will again disappoint. There is a mountain of empirical evidence that supports the existence of these flaws, which are actually generated by an anti-symbiotic relationship between experienced leaders and progressive management. Status-quo oriented leaders have difficulty understanding or embracing a change-oriented management practice. Take items 1 and 2, which are perhaps the greatest structural flaws. Leaders who don’t know Lean cannot lead Lean, much in the same way that you cannot teach people how to play piano if you do not know how to play piano. Contrast that to conventional management (batch-and-queue material and information processing), where no special knowledge or capability is required by leaders. Structural flaws have, throughout modern history, lead to the inevitable characterization of progressive management as a fashion, trend, craze, fad, or cult. This characterization can rapidly develop in organizations where highly educated people are in direct contact with customers, such as healthcare, higher education, or law. How can Lean survive if words such as these become its popular characterization? Lean will eventually undergo a name change* and some modification as well. But, to what end? 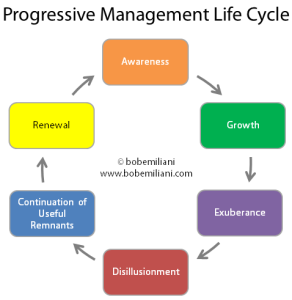 The progressive management life cycle will surely repeat itself. 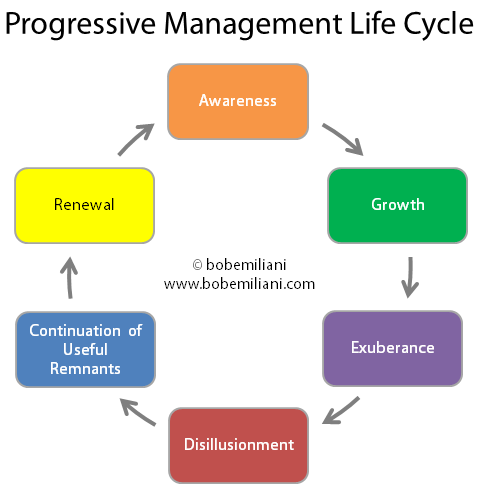 Progressive management is an elegant solution to the fundamental problems that all organizations face. It is surprisingly simple and highly effective in its ability to solve multiple problems, if and only if its users understand it. And therein lies its main structural flaw: Most users don’t understand it. A flaw inherent to conventional management is that one solution always generates multiple other problems. Another flaw inherent to conventional management is large variability in its practice which is transferred to Lean management as if this variability is a standard (target condition) that leaders must aspire to. Managers are not allowed the variability with Lean practice that they are allowed with conventional management practice. Can we find effective ways to interrupt this transfer process or eliminate its occurrence to begin with? If not, then we must consider the question: Is some improvement better than no improvement? Yes, if people are not harmed by improvement. If people are harmed by improvement, then no improvement is better than some improvement. While no improvement will eventually do harm to people, some improvement done incorrectly immediately harms both people and Lean management, which accelerates the progressive management life cycle. * Perhaps in the future Lean management will be called “Standard management.” Flow, being the normal (target) condition, is the standard for any organization. Management towards the normal condition must be the standard, and Standard management is a fractal in that it asks people to establish standards for every process, from the production floor to the CEOs office, as they undergo improvement (PDCA) . I don’t view the items on your list as flaws, per se. Most of them are inherent to any change. Like saying, “One of the flaws of driving a car vis a vis using a horse and buggy is that you have to learn how to drive a car.” Well….yeah. We might look at that as a circumstance that makes the transition from buggy to car a challenge but I don’t know that we’d look at it as a flaw of “driving a car”.